Elisabeth Barret Browning and, many years later, Simone Weil intepreted line 250 of Aeschylus’ Prometheus Bound (tufla;" ejn aujtoi'" ejlpivda" katwvikisa) as «I set blind Hopes to inhabit in their house», or (Weil) «aveugles espérances». Both linked «blind hopes» to the hope of immortality. This passage, and Hesiod’s ejlpiv" in Pandora’s episode, should be interpreted assuming the standard meaning of ejlpiv" in Greek, i.e. «expectation». Blind expectations point to the inescapable human destiny, death, but they make possible a true human condition, different from the life of gods insofar as human condition implies temporality. Facing Solon’s challenge to Croesus in Herodotus’ account, some Hellenistic philosophies, and particularly the Epicurean tradition, tried to answer the question denying it, therefore promising to transform human life into a ‘divine’ life. 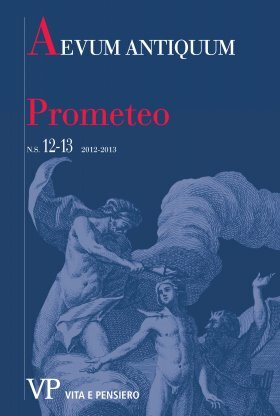 But Lucretius shows that this attempt is not human, confirming Prometheus’ gift as a necessary condition to make sense of one’s life.